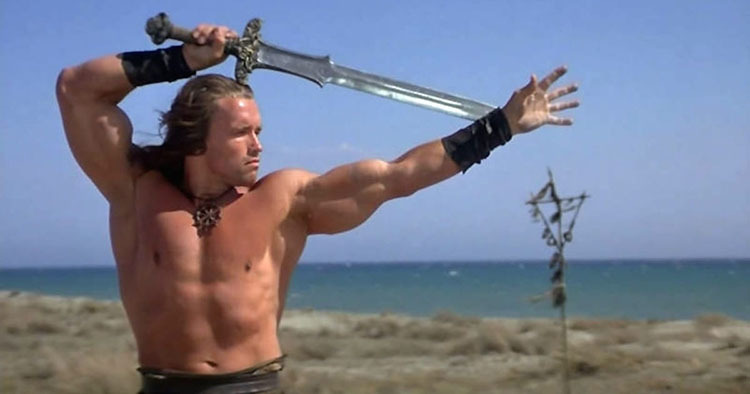 There are quite a few Conan the Barbarian Swords available on the internet these days. From cheap knock-offs to high end, licensed fully functional replicas costing thousands and everything in between,this guide has you covered. 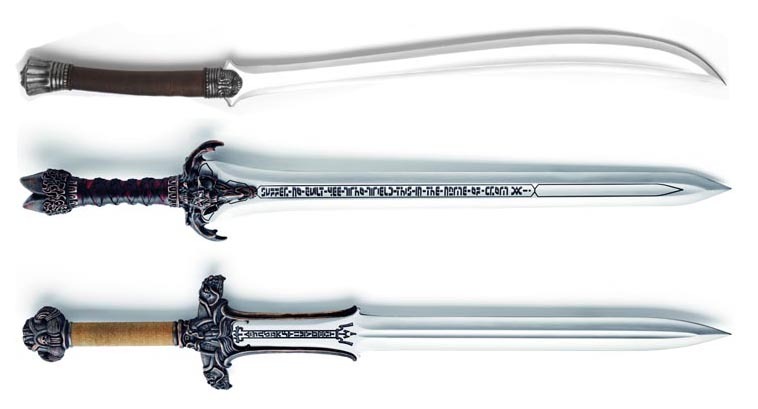 For a start though, let's define the different Conan the Barbarian Swords as there are a few different designs to choose from. 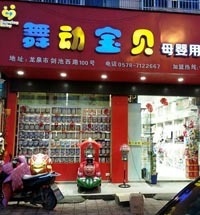 Below is a picture of each one. 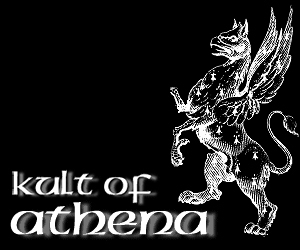 While Valeria's Sword and the Fathers Sword (sometimes also called the 'Master Sword') are popular in their own right, the Atlantean sword is usually the first pick of anyone looking to start a collection of Conan the Barbarian Swords as it was the sword that Conan found in a tomb in the original Conan the Barbarian movie, and used it to great effect against all manner of enemies. 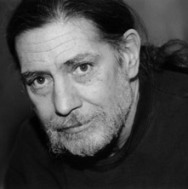 The original sword was designed by the late, great sword maker Jody Sampson - who also designed swords for many other movies, television series and for the theater - embellishing it with runes of his own creation and drawing on his own imagination and extensive experience in both knife and sword making. 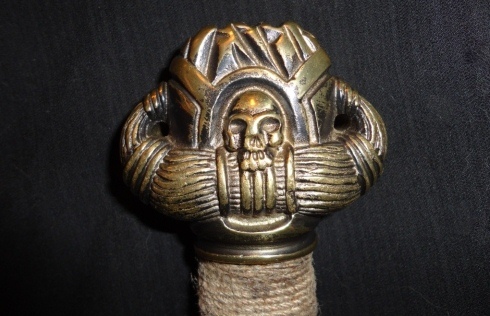 But without a doubt, it is the Atlantean Sword that he is most fondly remembered for - and the one most frequently copied and imitated. 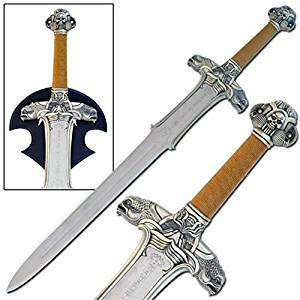 Most replica Conan the Barbarian Swords are extremely cheaply made from stainless steel with fragile, rat tail tangs attached to extremely heavy, unwieldy blades and are not suitable for anything other than display purposes. And many of them, not even suitable for that - with loose or rusted fittings, major deviations from the original design and a cheap, rather ugly appearance. All of these are unlicensed knock offs, usually made in Pakistan or China, and while cheap - for the most part are an utter waste of money. 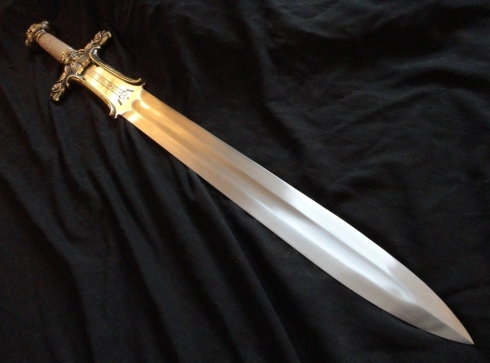 However, there were some licensed replicas out there made by Marto of Spain which, while also made from stainless steel, were faithful recreations of the originals and priced at around the $300 mark. 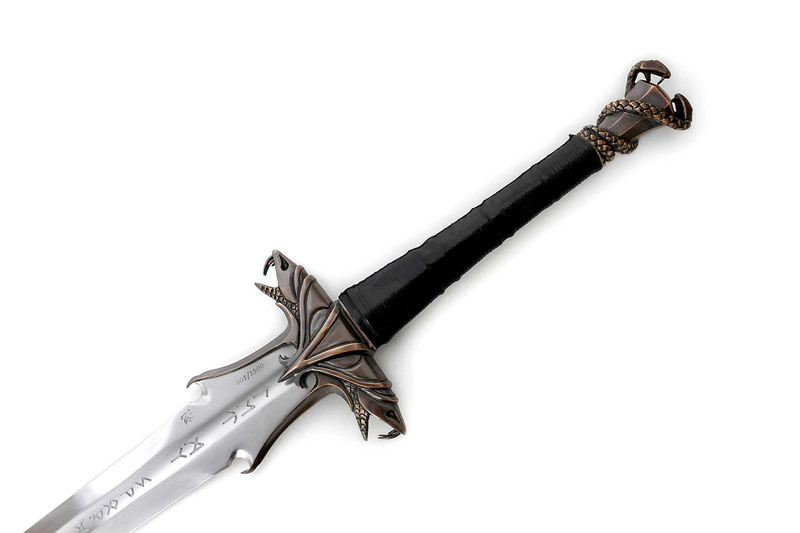 Now-a-days however, the official license has been passed on to Windlass Steelcrafts - an Indian company well known for producing affordable, fully functional swords for both collectors and even armies around the world.. So let's take a look at those shall we? Now we are talking.. fully functional replicas! 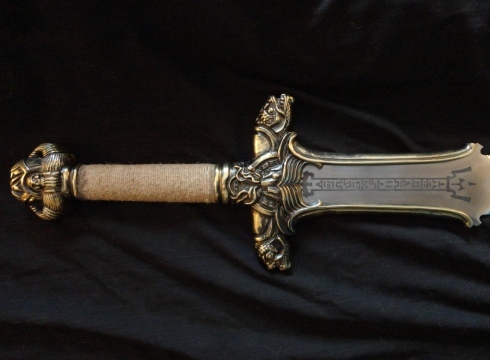 As an officially licensed sword, the Atlantean Sword by Windlass Steelcrafts is an ornate, fully functional version of the sword Jody Sampson originally designed. But, at around the same price as the decorative Marto sword was sold for, it is not going to be without a few minor problems here and there. 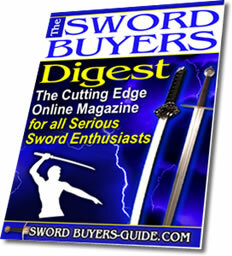 As THIS version is the current officially licensed version - let's take a little time out to examine it in more detail with a hands on review that first appeared in the March 2012 edition of our monthly newsletter, the Sword Buyers Digest. Honestly, I was ready to hate this sword as soon as I saw it. I thought it would be gaudy and unwieldy in person, and a let-down after the hype that surrounds the Conan franchise. However... I didn't, and it wasn't. My inner (ok, not so inner) movie nerd had to pop Conan in the DVD player and watch it with the sword leaning beside me on the couch. I was prepared for it to be cheap-looking and cheap-feeling, having loose bits and poorly-recreated bronze fittings. The twine does move (a lot) on the handle, but on first inspection I have no complaints about the blade or bronze furniture. Centre of Percussion: to be honest, I don't know. 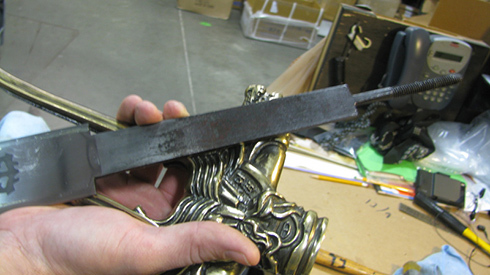 The blade is so thick and heavy, it just doesn't behave like other swords do. In a word, sturdy. There are no bends or imperfections that I can see. 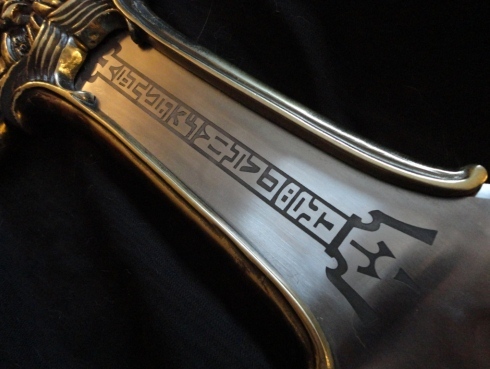 The etching of the runes looks nice and even, and no difference from one side to the other. The twine on the grip does twist quite a bit. If this were a sword I was planning on using a lot, I would probably see if it could be re-wrapped or something. Well, honestly, if it were a sword I would be using a lot, I don't think twine would be my first choice for a comfortable grip. But we're not exactly looking for comfort with this bad boy, are we? From what I can tell from the movie, close-ups of the original prop swords, and the Albion recreations, the guard looks like it should. 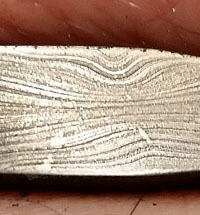 The bronze is blackened in the creases slightly unevenly from side to side but it's not overly noticeable. The guards extending down the ricasso do rattle slightly when the guard or pommel is struck, but nothing feels loose when handled. 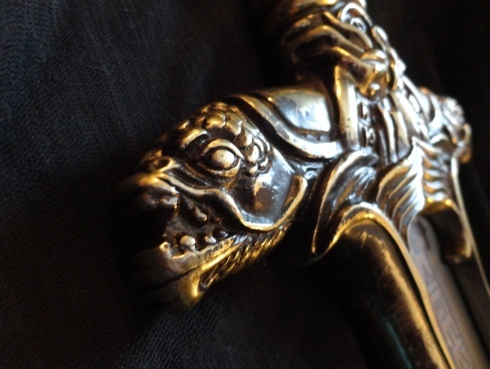 Pretty much the same story as the guard – from what I can tell, the pommel has the design that it should. There have been some complaints with this sword being shipped with loose pommels, though this one in particular feels quite solid. Ha ha... ha. Either I need to work out a LOT more, or perhaps find a lighter sword. Since I DON'T want guns like Arnie, I won't be going with option 'a.' I can heave it off the ground, but that's about it. I can see why Arnold took steroids. My husband Kevin, however, can do a pretty impressive Arnold-like twirl with it, and hopes to sharpen it and take a whack or two at a pig carcass in summer. Beyond the occasional experimental pig-mashing, though, it's really not a functional blade. On a more serious note, in doing a little research there had been some concern that this sword might have the dreaded rat-tail tang. 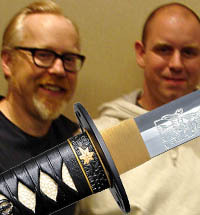 I was planning on disassembling my sword to see for myself before letting Kevin sharpen it. No flying helicopters of death here, please. However Marc Kaden Ridgeway toured Windlass and recently posted pictures of the sword pre-assembly, with lots of good visuals on the tang and my fears have been assuaged. And now, drumroll - the high end! 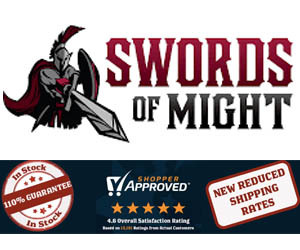 So far we have some cheap replica Conan the Barbarian Swords that no serious collector should even really be giving a second look to, the discontinued Marto replicas - and then a step in the right direction with the officially licensed, fully functional replicas by Windlass Steelcrafts. 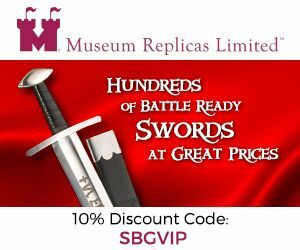 But the most discerning collectors know that the very best of the best replicas are made by Albion Swords from the ORIGINAL molds used to create the swords used in the movies by none other than Jody Sampson himself (after all, Jody became a full time employee and designer at Albion). Yes, like any other version of this fantasy sword - it is extremely heavy and not very practical to wield unless you have muscles like Arnie. 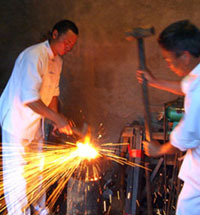 And like the Windlass version, it is unsharpened by default. 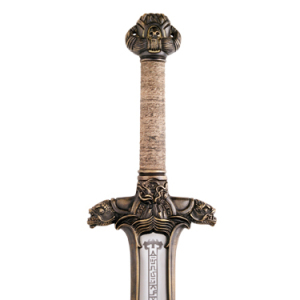 But no other version comes as close to being as beautiful and true to the Conan the Barbarian swords seen in the movie - though the $3200+ price tag and a wait time exceeding one year may put all but the most die hard collectors off - THIS is the version that true Conan fans dream about.. 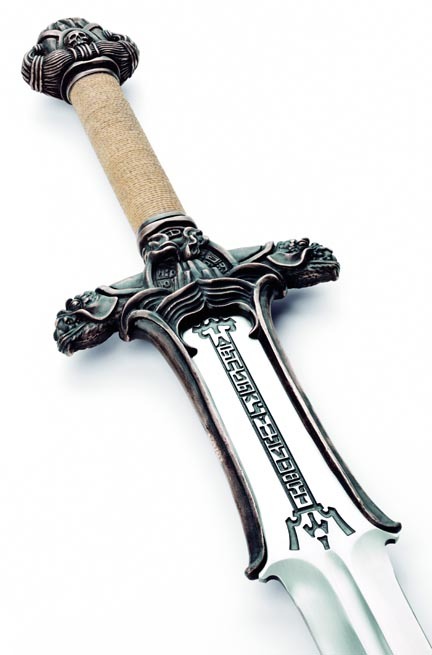 While outright copies of this sword without the official license are technically in violation of copyright - it is perfectly acceptable for artisans to use the design concepts and general style of the Conan the Barbarian Swords as a starting point to create their own works of art. Brendan Olszowy from Fable Blades has done just that - making some one off designs of his own heavily inspired by Conan. 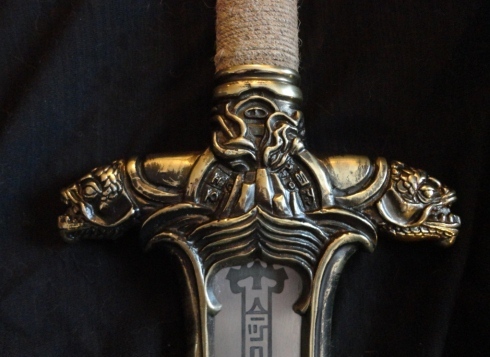 And then there is the clearly inspired by the Atlantean Sword the Warmonger by Darksword Armory - an original and fully functional design available right here at the SBG Sword Store that fills the gap between the Windlass and the Albion versions in many respects. 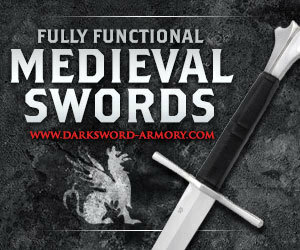 No doubt more swords will come about based on the originals over the years - and there is nothing wrong with this if it is purely inspirational. 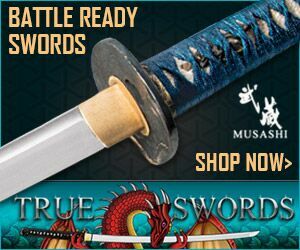 It is only when a company attempts an illegal copy that things get a bit questionable - and we strongly encourage sword buyers to avoid replicas that infringe copyright as in the long run, illegal knock offs are not good for anyone. 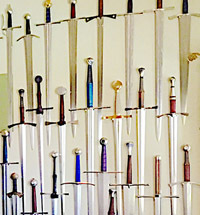 But as inspiration, well - that's actually not a bad thing at all and, as you can see from the three swords above, can result in some true works of functional sword art.